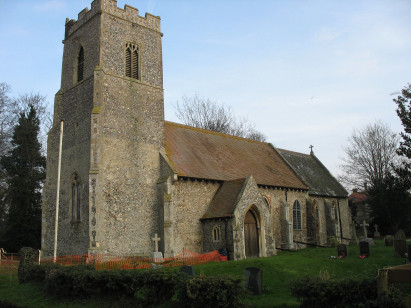 The parish of Thrigby lies in eastern Norfolk about 7 miles northwest of the port of Great Yarmouth. Thrigby sits on the former island of Flegg in Broadland around a mile south of the A1064 road which connects Acle through to Caister. 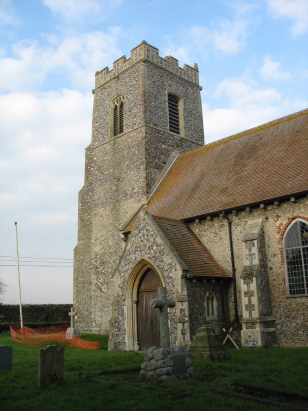 Thrigby is a small parish (less than 600 acres in size) situated on the eastern banks of the Muck Fleet, a short channel connecting Filby Broad with the River Bure. Thrigby itself is little more than a hamlet - sited at just 3 metres above the sea it nevertheless is a little higher than river level and thus just dry. Most of the parish is sandy arable land (the former island) whilst alongside the river the traditional Broadland pursuits of wildfowling, reed harvesting and grazing marsh would have all played their part in the economy. St Mary's church sits adjacent to Thrigby Hall on the eastern side of the lane that runs through the parish. For once St Mary is built in the Decorated style which preceded the normal Perpendicular of Norfolk's great church building era. The church was, therefore, largely built during the early part of the 14th century. Pevsner cites, in particular, the western tower and both southern & priest's doorways as being examples of the period. There was, however, a major restoration, in this case of 1896, which changed much; much of the fenestration as well as the chancel arch and roofing were all refreshed or replaced. The church sits in a hedged churchyard with its western tower close by to Thrigby Road, the lane is narrow so care is needed for parking. A large metal gate grants access to the churchyard, a horseshoe shaped stand of trees encloses much of the eastern end of the church and somewhat limits the angles available for photography. The parish only recently deposited its baptismal register, this standard 800-entry book is thus yet to be filmed and the transcript was prepared from the original register making for easy reading and no image issues. The register runs beyond the transcript period and was closed in 2015. Few issues were noted in what was therefore a straightforward piece to prepare.